The Texas 4000 ride for cancer awareness is winding down as the riders make their way to their final stops before reaching Anchorage, AK. From June to August, three teams of riders make their way from Austin, TX, to Anchorage, AK, while building awareness and raising money for the battle against cancer. Along the way, sponsors provide the riders with to support the cause. 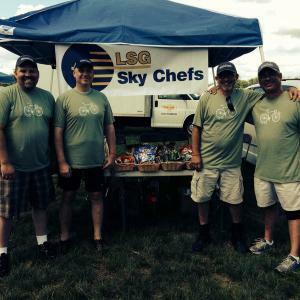 LSG Sky Chefs North America was pleased to once again sponsor this event for the fourth year in a row by providing meals to the riders that peddled through the communities we operate! Our teams in Anchorage (ANC), Austin (AUS), Dallas (DFW), Denver (DEN), Houston (IAH), Minneapolis (MSP), Portland (PDX), San Francisco (SFO) and Seattle (SEA) supported the riders on their way. Their donations of nutritional food and beverages helped refuel the riders throughout their journey.